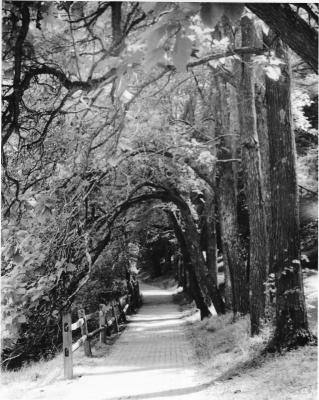 Arispe's silver gelatin print entitled "Archway of Trees." Wilson College senior Wendy Arispe will host her capstone art exhibition from 4:30 to 6 p.m. on Thursday, Dec. 13, at the Bogigian Gallery in Lortz Hall on the Wilson campus. Admission is free and open to the public. Arispe is majoring in graphic design, with a secondary emphasis in photography. Her capstone project focuses on human emotion, incorporating poetry, photography and poster design. Additionally, a series of her photographs will be on display. The Bogigian Gallery is open from 9 a.m. to 5 p.m. Monday through Friday. For additional information or an appointment, contact Professor of Fine Arts Philip Lindsey at 717-264-4141, Ext. 2783, or philip.lindsey@wilson.edu.